It has to be said it was a trifle embarrassing, a forty something man like myself behaving like a star struck schoolboy and I had to explain to my younger colleague why I was so impressed but it is a bit better than a friend of mine, who upon meeting Dixie, told him that he still had a photo of him on his bedroom wall. And he was in his twenties at the time. 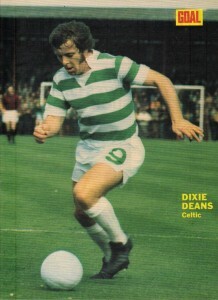 John ‘Dixie’ Deans was only at Parkhead for five years but made a huge impression during that time. Despite being on the small side Dixie was ‘Larssonesque’ in the air when timing his headers and scored many goals this way and also had a physical presence which he put to good use and defenders hated playing against. Had Celtic not lost to Partick in the 1971 League Cup final then Dixie might never have been a Celt. Jock Stein felt after that game that Celtic needed more purpose up front and Dixie was procured for a small fee from Motherwell. His Celtic career was a mixture of highs and lows although there were certainly far more highs. Dixie is well remembered for his achievements but, sadly, also for missing a certain penalty. Picture the scene: A European semi final with Inter Milan has finished goal less over two legs and the game goes to penalties in front of a packed Celtic Park, the prize being a place in the final in Belgrade against the great Cruyff inspired Ajax team. 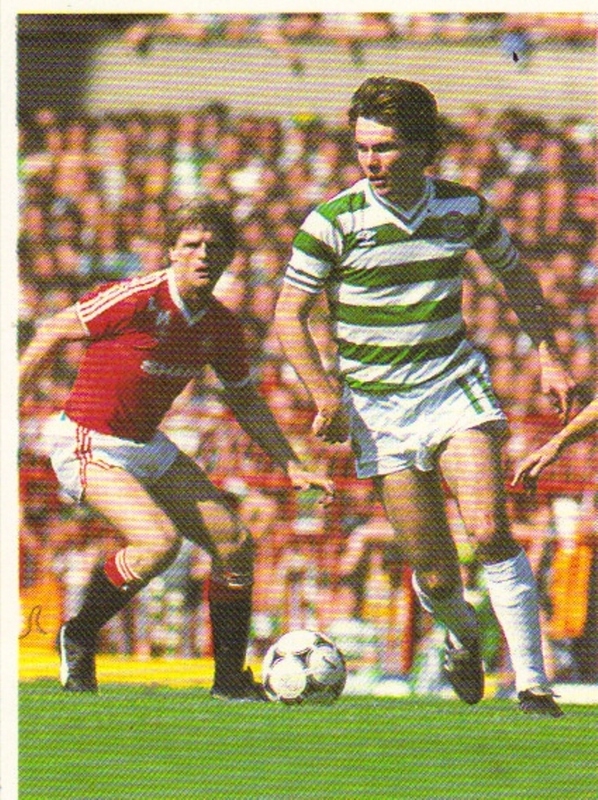 As any Celtic fan will testify Dixie missed his kick and out Celtic went by 5-4. Painful doesn’t even begin to describe it although as it happens I don’t think we would have beaten Ajax but with Johnstone, Macari, Dalglish and Deans in the side we would have appreciated the opportunity of trying. 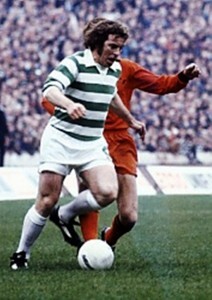 Part of my fascination with Dixie is that I was at an impressionable age when he was Celtic’s number 9. 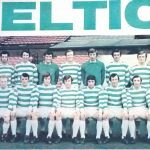 No squad numbers in those days and the number 9 then was expected to be in position to score goals and not to ‘run the channels’ or wander the field aimlessly a la Fortune and Samaras of the current crop. 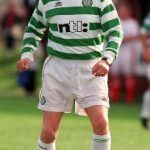 In those days Celtic players were expected, if not demanded, to give their all for the privilege of pulling on the green and white and few players surpassed Dixie for effort. He had a wonderful on field relationship with a young Kenny Dalglish but was equally comfortable partnering Macari, Hood or Lennox. 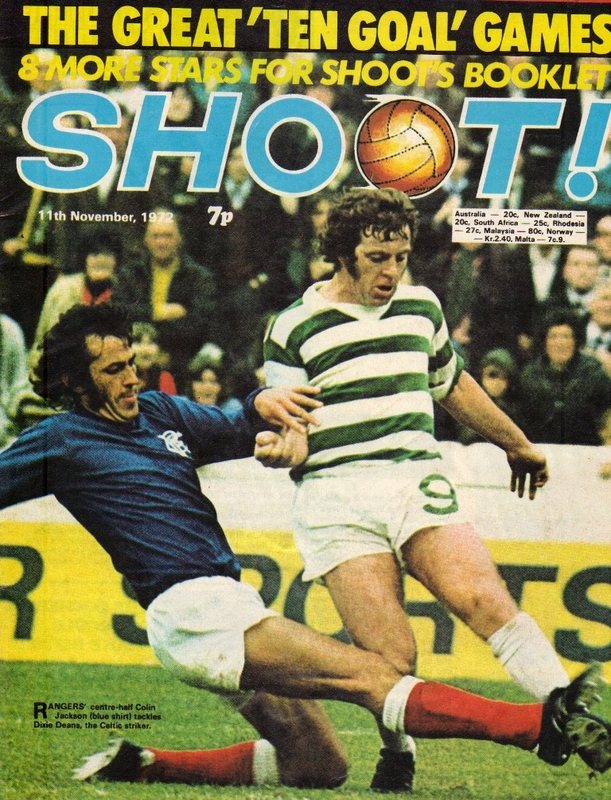 In November 1973 Celtic thrashed Partick Thistle by 7-0 which was a notable result considering Thistle had a decent side then, including Alan Rough, John Hansen and Ronnie Glavin. Dixie scored six of Celtic’s goals that day and but for Rough’s heroics in goal he could have surpassed the great McGrory’s record of eight goals in a game from 1928. However you cannot have an article on Deans without mentioning his record against Hibs. The Easter Road men also had a fine side in those days but Dixie scored an impressive 18 goals against them in 13 games bearing in mind that sides only played each other twice in those pre Premier League days. 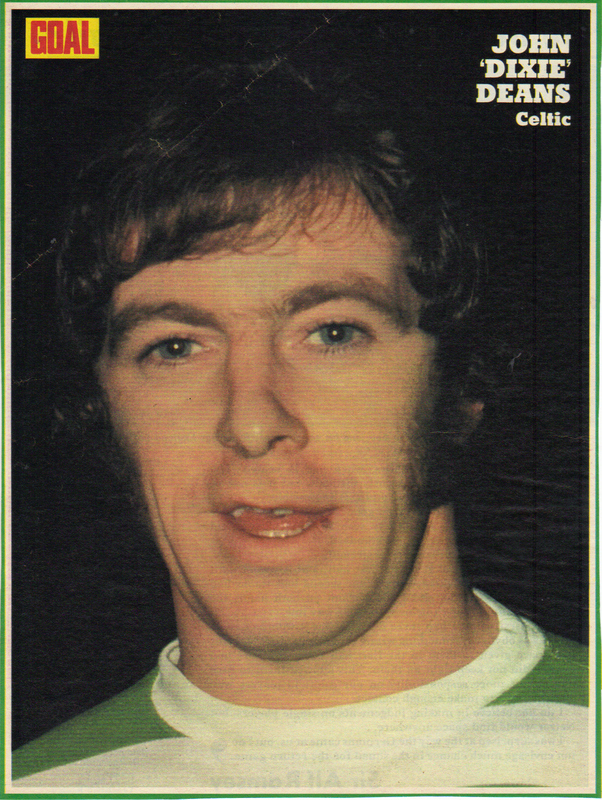 It’s well documented that shortly after the Inter Milan disappointment he scored a hat trick against Hibs in Celtic’s 6-1 thumping of Hibs in the 1972 Scottish Cup final. His goals were all impressive efforts but the main recollection is of Dixie performing a spontaneous cartwheel after his third effort which led kids all around the country trying to copy him for months afterwards. 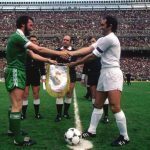 In October 1974 Celtic faced Hibs twice in seven days in two important fixtures. 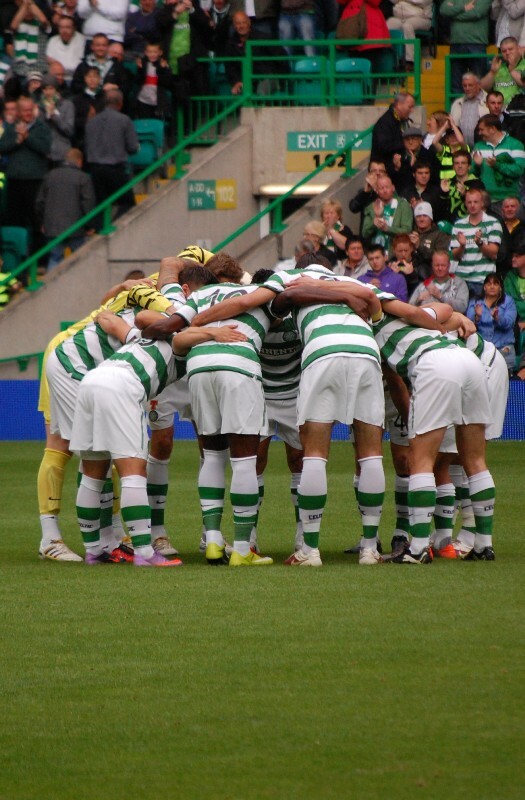 In the first game in the League at Parkhead Celtic had walloped them 5-0 making them overwhelming favourites to win at Hampden in the League Cup final a week later. 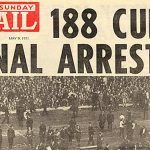 Despite noises made in the press by various Hibs players on how they had assembled a system to stop him, it was all to no avail as the bold Dixie cracked in another hat trick in a memorable 6-3 victory. His third goal that day was spectacular, a flying header to divert an aimless Jimmy Johnstone volley, giving Dixie another opportunity to perform the obligatory cartwheel on the Hampden turf and the papers to again churn out the headline: ‘Dixie – Hammer of the Hibs’. 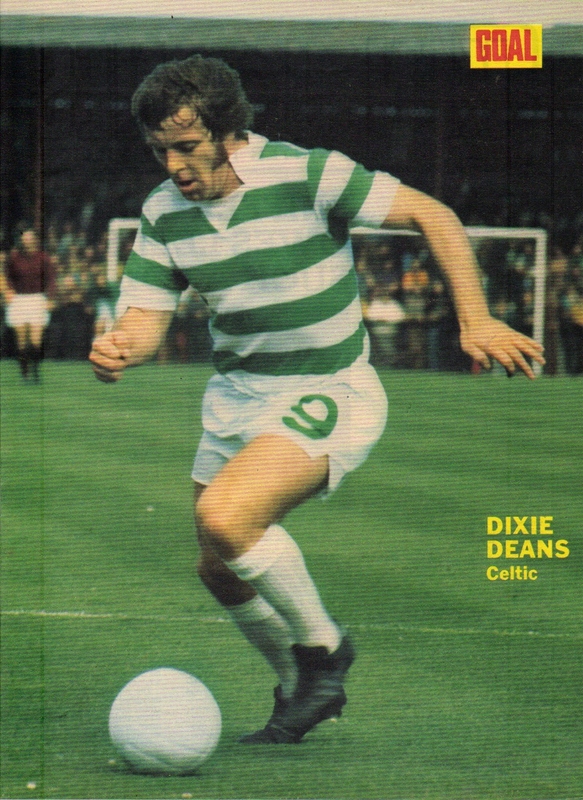 Dixie was actually a headline writer’s dream and I can recall ‘That old Dixie melody’, and ‘They’ll never drive old Dixie down’, being used regularly from his Celtic days. 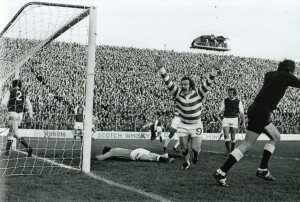 If Dixie was prolific against Hibs then he was somewhat impotent when it came to scoring against Rangers. Arguably he scored once at Ibrox in 1973 when his thumping volley was diverted past Peter McCloy by the Rangers’ defender Dave Smith. The shot was on target and these days a striker could claim such a goal easily but at that time harsh judgement was shown and most people recorded it as a Smith own goal. For such a prolific scorer he had a poor record against Rangers although so too did Joe McBride so he is in good company. He would have scored in the cup final of 1973 against Rangers when he was only foiled by a save on the goal line by John Greig that Gordon Banks would have been proud of. There was disappointment in 1974 when Dixie was left out of the Scotland squad for the World Cup finals in West Germany. He had made the initial 40 man squad but is said to have narrowly missed the final cut of 22. Curiously, Donald Ford of Hearts and an ageing Denis Law were taken in the squad and it’s felt that Dixie could have brought more to the table than either of those two. 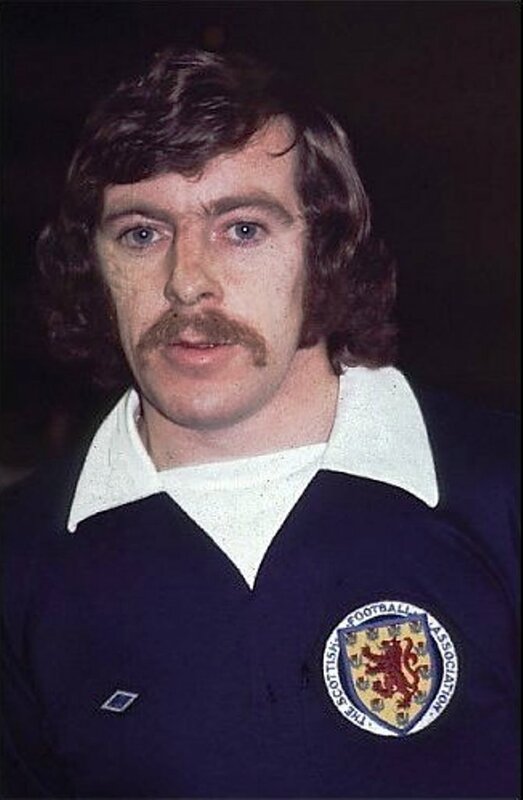 He was eventually capped in late 1974 in a 3-0 win against East Germany and then appears to have been a victim of the 2-1 defeat against Spain, when Billy Bremner missed a penalty, as that was his second and last cap. There was sadness when he left Parkhead in 1976 for Luton Town and he was eventually to achieve cult status in Australia with Adelaide City with whom he played for four seasons. In 1979 Adelaide played Sydney City who had a defender called Kevin Mullen rated the toughest in the Aussie league. With his side two nil down Dixie went into overdrive and rattled in a hat trick to give his side a memorable 3-2 victory and destroyed Mullen in the process. My Australian contact tells me that Dixie wasn’t entirely fearless….apparently he has a great fear of spiders and was in a constant state of paranoia down under that big hairy spiders might attack him at any time which was a great source of amusement to his Adelaide team mates. Dixie lost his front teeth for the Celtic cause and photos of the period show him celebrating goals with that typical toothless grin. He was one of those players who took great joy in scoring goals and loved to celebrate with the Celtic fans with whom he had such a wonderful rapport. The fans took to him immediately and appreciated his efforts on field and it was said that he was quite a character off the park as well which endeared him even further to the supporters. 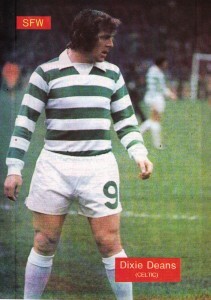 Dixie Deans was a top class striker and is an all time Celtic great. 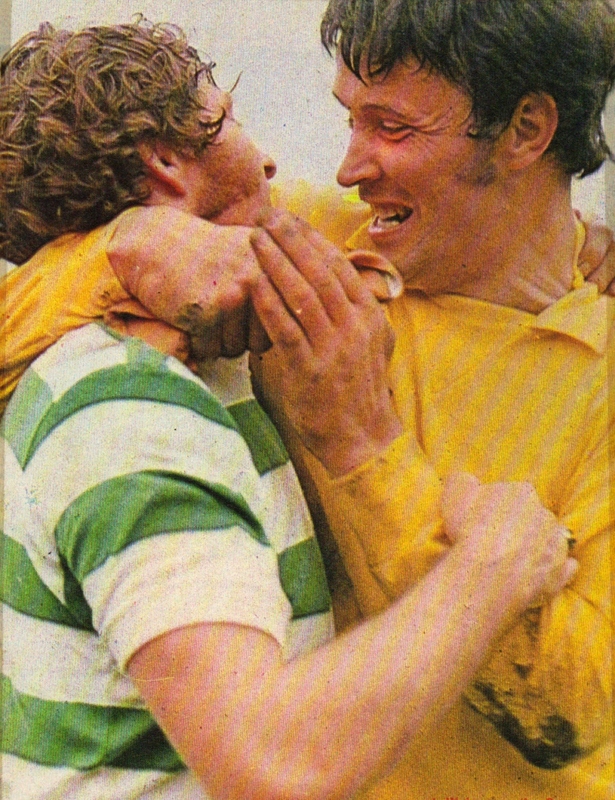 Pic 1 is from Goal magazine 1971. Pic 2 shows Evan Williams salute Dixie after the ’72 final. Pic 3 is a front cover from Shoot magazine 1972 with Colin Jackson. Pic 4 is from Shoot 1974. 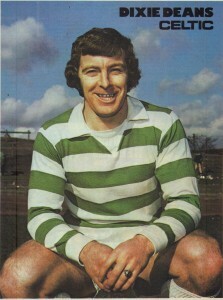 Pic 5 is from Goal magazine 1973. 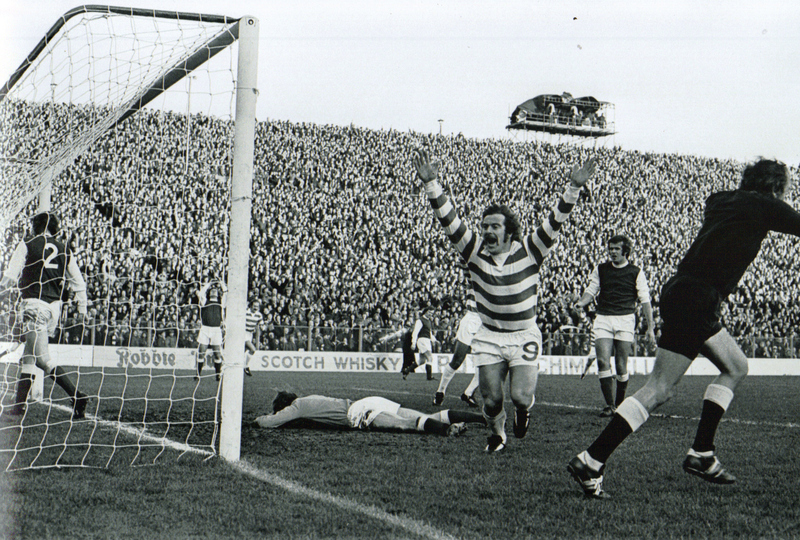 Pic 6 shows Dixie celebrate after scoring the first goal in Celtic’s 2-0 win at Easter Road in January 1975. Look at the size of the crowd and the dodgy TV gantry above the terracing ! Pic 7 shows Dixie on his Scotland debut in 1974. 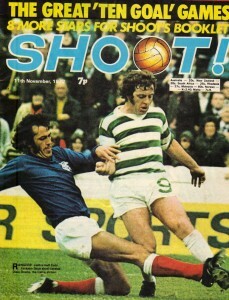 Pic 8 is a pic from Scottish football weekly in 1974.